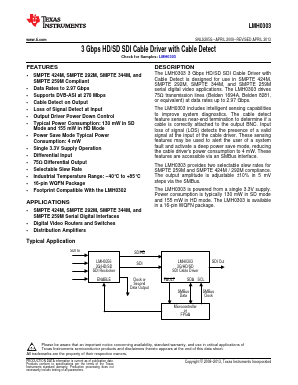 The LMH0303 3 Gbps HD/SD SDI Cable Driver with Cable Detect is designed for use in SMPTE 424M, SMPTE 292M, SMPTE 344M, and SMPTE 259M serial digital video applications. The LMH0303 drives 75Ω transmission lines (Belden 1694A, Belden 8281, or equivalent) at data rates up to 2.97 Gbps. The LMH0303 includes intelligent sensing capabilities to improve system diagnostics. The cable detect feature senses near-end termination to determine if a cable is correctly attached to the output BNC. Input loss of signal (LOS) detects the presence of a valid signal at the input of the cable driver. These sensing features may be used to alert the user of a system fault and activate a deep power save mode, reducing the cable drivers power consumption to 4 mW. These features are accessible via an SMBus interface. The LMH0303 provides two selectable slew rates for SMPTE 259M and SMPTE 424M / 292M compliance. The output amplitude is adjustable ±10% in 5 mV steps via the SMBus. The LMH0303 is powered from a single 3.3V supply. Power consumption is typically 130 mW in SD mode and 155 mW in HD mode. The LMH0303 is available in a 16-pin WQFN package.